The Chinese American Museum is located in the red-bricked historic Garnier Building, located at El Pueblo de Los Angeles Historical Monument across from downtown Los Angeles’ Union Station. Walk past the main plaza area, south of Olvera Street, to find the museum site. All exhibits are accessible for wheelchairs. By Rail: Take the Metro Red Line, Gold Line, or Purple Line to Union Station/Gateway Transit Center. Exit the station and walk across N. Alameda Street to El Pueblo Historical Monument. By Bus: There are several bus stops located near the Museum. Please visit the MTA website at www.mta.net or call 800-COMMUTE for more information. A map of the parking lot is located here. Parking is based on availability. Street parking in the surrounding neighborhood is limited. 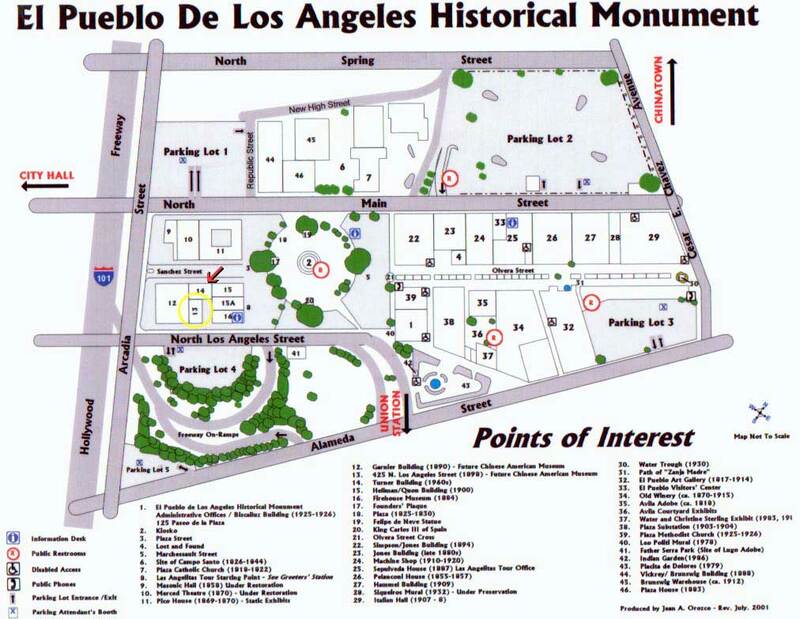 Parking is not free, you can find parking rates at the El Pueblo de Historical Monument’s website. The Chinese American Museum offers self-guided or docent-led tours to schools and community groups of 10 or more individuals. The Museum offers special tours for adults and school groups. Docents will guide and interact with groups through our exhibits illustrating the history and experiences of Chinese Americans. Guided tours must be scheduled at least three (3) weeks in advance and are subject to docents’ schedule and availability. A typical tour will last approximately 55 minutes. The maximum capacity for tours is 30 people. The Museum reserves the right to delay or restrict admission if a group arrives more than 15 minutes late. Description of the group such as grade level, age, etc. Groups are welcome to explore the museum on their own. Self-guided tours are welcome during regular Museum hours. Due to safety concerns and occupancy limits, it is highly recommended that tours with groups of ten or more be scheduled in advance. Groups must have at least one chaperone per every 10 children.